Your Uncle Potts has fallen on hard times. His flower business is about to go under and he needs your savvy business sense to save the bulbs. Help your uncle by selling his flowers throughout the city in your flower stands. Advertise and upgrade your business to compete with other flower vendors. 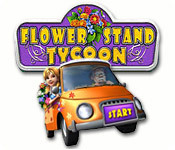 Grab their customers and their market share to become a flourishing Flower Stand Tycoon. Flower Stand Tycoon is rated 3.8 out of 5 by 5. Rated 5 out of 5 by Blooming_Lilac from Cute and fun little gem! If you enjoyed Fairy Godmother Tycoon and DinerTown Tycoon, you would probably like this game as the game mechanics are very similar. Your objective is to put your 3 competitors out of business (which isn't as easy as it might seem). I bought the game on sale, thinking it might be short and/or boring, but I really enjoyed the trial. I'm so glad I decided to buy it. It's definitely worth full price. The replay value is high because your decisions will have different consequences each time. While you'll be performing the same actions, i.e. ordering flowers, reading the news, and setting your route(s) each day, you'll have different options to choose from such as hiring a lawyer to file a frivolous lawsuit, donating money to a homeless man, and hiring a competitor's former employee to sabotage their research. These options can bankrupt you or put someone else out of business. The second time I played the game, I lost everything for choosing to sabotage my opponents. Police officers and mechanics will approach you and offer to "help" you out. I wanted to play fair, but it takes a lot longer to reach your goals that way. ;-) Basics: *Music is pleasant. I've been playing for hours with it turned down low and it hasn't bothered me. *Windowed mode - Yes *Widescreen - Yes *Graphics - Cartoon-ish, cute, and colorful - Game menus are easy to read. *Daily news is humorous. *There's no timer and no rapid clicking to tire you out. *Custom cursor is okay. *Tutorial is helpful. 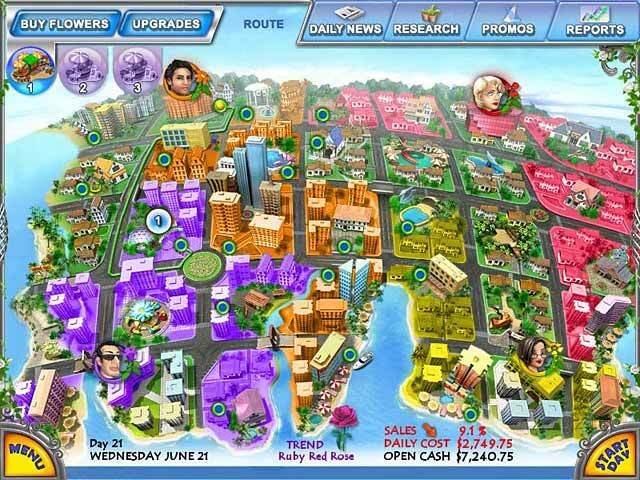 You earn extra merchandise by making a certain amount of money and by placing your carts on more than half the areas on the map. The main thing to keep up with is your market share. My opponents have more cash than I've made, but I'm holding my own on my 3rd play-through. I recommend playing the demo and exiting before the hour is up so that your progress won't be lost. I had to start over when I downloaded the full version. Other than that, I've had no problems. It's worth a look if you're wanting a relaxing and fun strategy game. Rated 4 out of 5 by Aamaretto from Fun but short tycoon game The goal of this tycoon game is to grow your flower stand business by upgrading your carts, taking over neighborhoods, and running your competitors out of business. The first time I played, I was confused about how to achieve the goal of running your competitors out of business, so I played for several hours, not sure where things were going. It was fun to meet achievements (like "make your first $100,000") and get new inventory. Once I realized what the goal was, all three competitors had firmly entrenched themselves. I restarted the game and was able to beat it in an hour. It reminded me of the board game "Risk" once I got into the swing of things. I did like it, which is why I gave it four stars; however, I feel like it should have been longer and had different cities to take over. One of my favorite games of all time, Fairy Godmother Tycoon, was so well created and with such witty dialogue that any other tycoon game pales in comparison. 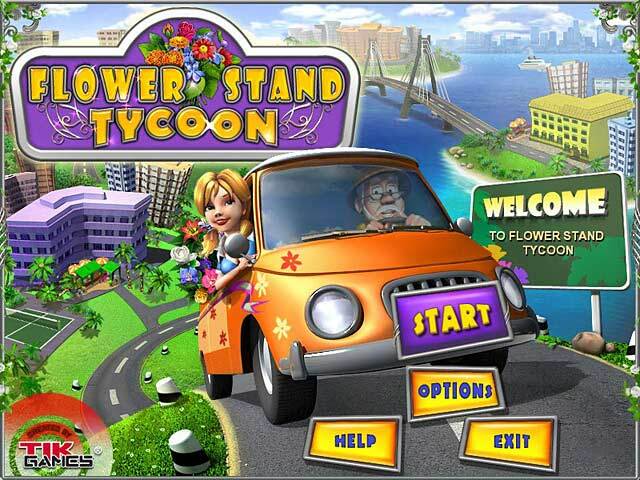 But Flower Stand Tycoon was fun and I feel like I got my money's worth. Rated 4 out of 5 by cianistarle from Not a bad little game! Review based on demo + one hour. I quite liked this game. Maybe not astounding, but decent fun and a good relaxing game. No bugs or gliches so far. If you are not familiar with the game type, the tutorial will help, but not hold your hand through everything. I good typical tycoon game. I look forward to many more hours and decent replay value. Like the previous reviewer said it is a 'spend money to make money' game. It has a decent plot and an average level of difficulty. Not overly clicky. I do not consider this a time-management game at all, so do not be put off by the description. Give this little game a try for a nice relaxing diversion! 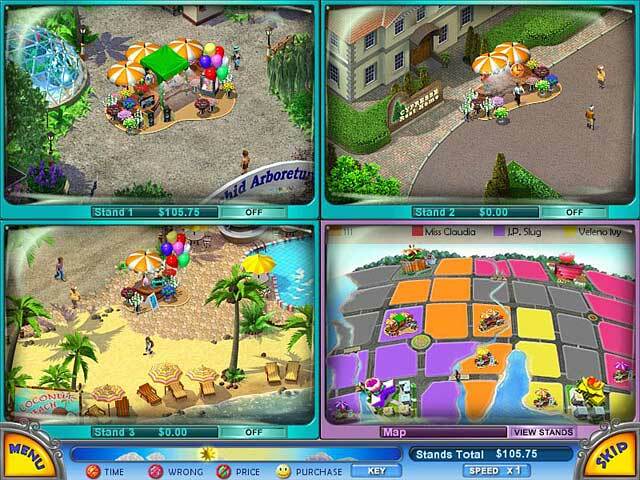 Rated 4 out of 5 by Marcum from Easy and fun tycoon game This is a basic tycoon game. Spend money to make money. The biggest problem with this game for me was it seemed a bit too simple. It is still fun, but I honestly dont think you can loose. Bottom line, yes its a numbers game, as a tycoon game should be. But I just did not find it challenging, so not sure how much I will replaying it. Rated 2 out of 5 by dawn91106 from Good luck trying to advance. this game sounded like it would be right up my alley. It was fun at first, but there is only one level. You never advance past the one map. Once you have all of the upgrades, and discovered all the flowers. you still get people saying they are not happy or you don't have the flower they want. Your sales never really increase, therefore you don't drive the competition out of business. Step in and save your Uncle Pott's flower business by selling bulbs around town in this time management game.